Caitlin Workmaster was looking for a way to support families with a child who was battling cancer, similar to the way her family had been supported when her younger brother was diagnosed with a rare form of cancer more than a decade ago. 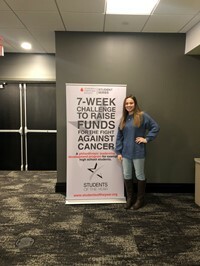 So, when she was presented with the opportunity to take part in the Leukemia & Lymphoma Society’s “Student of the Year” fundraising campaign, she jumped right in without any questions. After a rigorous application and interview process, she was selected as one of 15 local students to raise funds for the Western PA & West Virginia Chapter of the organization. The planning started in October, but the actual fundraising within a seven week timeframe between mid-January and early March. In that time, Caitlin coordinated a Hoops for the Cure basketball game, a donation class at Mecka Fitness in Mt. Lebanon, in-school pajama and hat days, #BetheKindKid Keystone Oaks t-shirt sales in conjunction with JAM Enterprises at Avonworth School District, raffle baskets, and corporate sponsorships. At the end of the seven week campaign, Caitlin and her fundraising team, raised nearly $11,000. Together, the 15 students competing for the title of “Student of the Year” raised $152,745. “I am grateful to the Keystone Oaks community for supporting my project and helping me exceed my goal,” Caitlin said. “And, it was awesome to see so many Pittsburghers support all of the student participants. For a group of 15 students to raise more than $150,000 is truly incredible,” she added.